While he never left stand-up behind, in late 2013 Dave shocked Australia by announcing that he would be giving up his radio and television jobs to go back to his roots touring a brand-new stand up show for an entire year. That show, Pointless sold over 60,000 tickets and went to every corner of Australia as well as overseas to LA, Montreal, the Edinburgh Fringe and Soho Theatre in London’s west end. 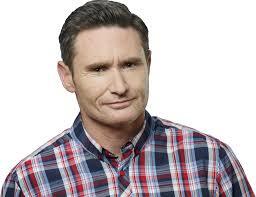 In 2015 Dave returned to the airwaves with long time co-host Kate Langbroek in a national drive radio program and in 2018, Hughesy and Kate is broadcast on HIT FM nationally from 4.30 to 6.30pm. 2018 was the fourth year that Dave opened the Logie Awards with a blistering and hilarious routine, smashing what is widely known as the hardest gig in the business. Dave’s brand-new television show Hughesy We Have a Problem, where Australia can have their problems solved by Hughesy and his expert panel of problem solvers, premiered on Network Ten in early 2018 to rave reviews from critics and audiences. Its first season was extended by the network not long after its debut and a new season has been announced for early 2019.